This is an important question that pops up in the mind of any applicant who is currently waiting for or in the process of interviews. All specialities received a large number of applications from residency hopefuls and then their applications are parsed into those that are invited for interview and those that are rejected. Having an idea of these numbers, will help the candidate arm with knowledge as to what he/she are up against. 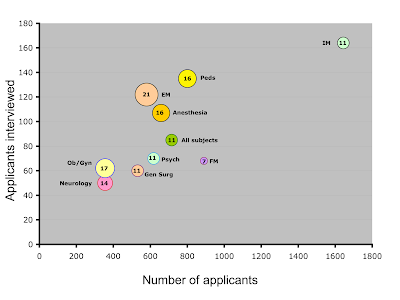 Number of applications was plotted on X-axis while number of interviewed applicants was on Y-axis. Ob-gyn, neurology, IM, FM, G surge, Psych, peds, anesthesia, EM were studied. The group 'total' represents the average of all specialities. 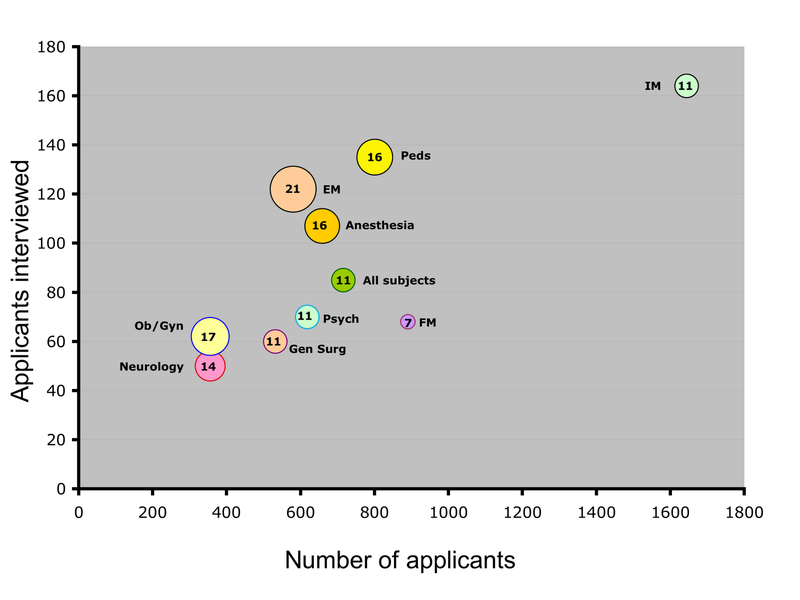 The number of applicants to number of applicants invited for interview was plotted on a cartesian graph. The size of the data point corresponds to the percentage of successful applicants who were invited for interview with the numerical value depicted in the shape. As you can see in Figure 1, there are immediate differences obvious amongst the subjects. While Emergency medicine had the highest percentage of interviews (21%), family medicine was surprisingly the lowest at 7%. This is because of a very high number of applicants and relatively less positions for the match. Pediatrics, anesthesia, neurology and ob-gyn had a decent rate of granting interviews between 14 and 17%. The mean and the mode were 11% which means that for every 100 applicants that apply, on average 11 are invited for interviews, 89 are rejected. These are dismal odds but this seems like the general trend. Next It was clear that there was a clustering phenomenon that had some specialities together while others far apart. 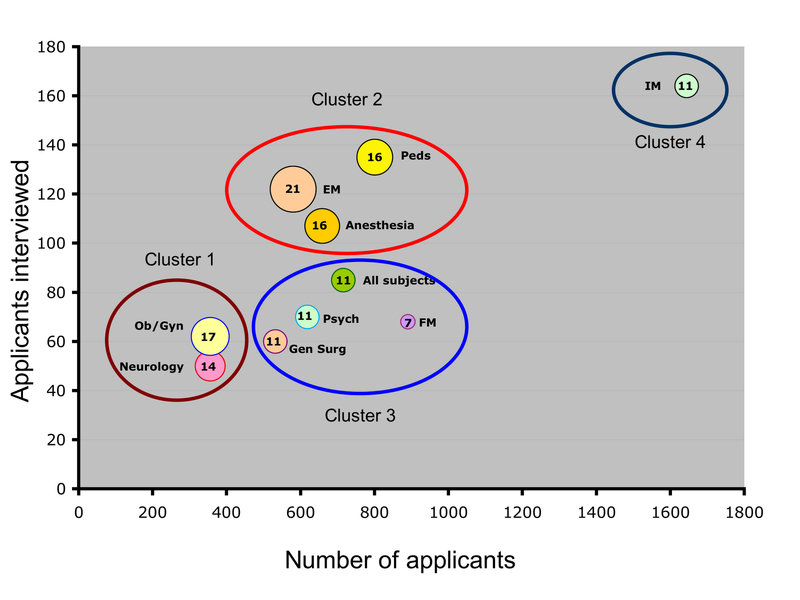 The subjects were divided into four clusters as represented in figure 2. 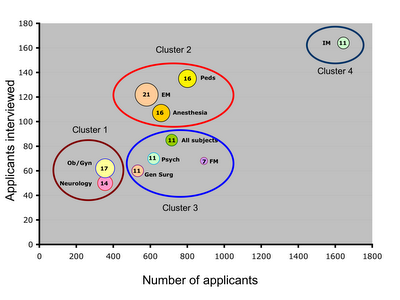 Cluster 4: high number of applications and average number of interviews.